I formed and fused 16 gauge fine silver into hoops, then hammered the hoops flat with my brass mallet. The earwire is 22 gauge sterling silver, formed by hand and wrapped for security. 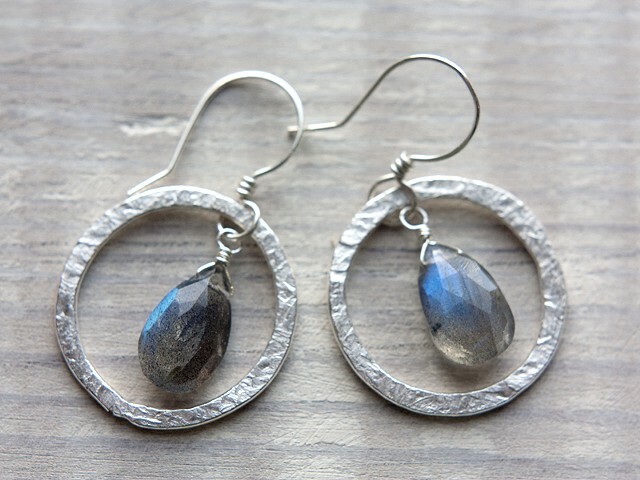 Labradorite is a beautiful grounding and healing stone. It helps connect you to both earth and water. It is soothing as well as creatively and psychically energizing. I was extremely picky when I purchased these truly beautiful labradorite pears shaped briolettes. They have lovely blue flash and would be great for every day wear, or dress up a classic outfit for a date! Give these to your wife, mother or friend for a special occasion! Or keep them for your own self! these earrings are 1.5" from the top of the earwire to the bottom of the hoop.